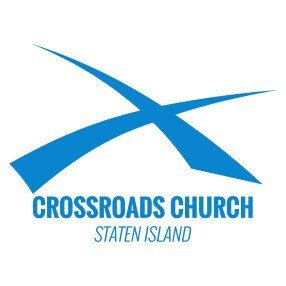 Crossroads strives to provide a loving experience for each person. We try to take a casual approach to church stuff, but encourage our people to pursue God with a serious faith. This approach is not the only one a church can have but it does work well for us here on Staten Island. 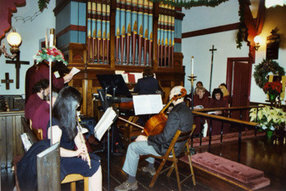 Crossroads "Community" Church was founded on September 29, 2002. The church started with the commitment of a dozen people and an American Legion Post Commander that allowed us to begin weekly services at his facility. After experiencing some growth, the church began to hold multi services but quickly outgrew the friendly atmosphere of the Cespino Russo American Legion Post. After several unexpected moves, Crossroads settled in at Public School 52 in Dongan Hills. 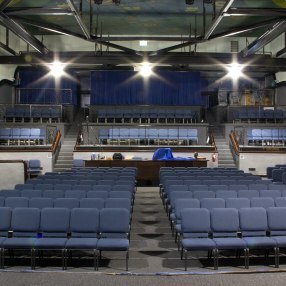 After spending four and a half years at Public School 52, we have moved into our new & current home, The Lane Theater! 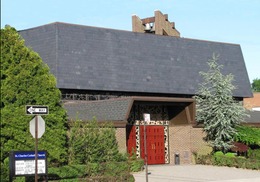 Located at the "Crossroads" of Staten Island, The Lane Theater is located at 168 New Dorp Lane. A casual atmosphere where you're welcome to sit back and enjoy the service. You are under no obligation to give unless you want to. Our Service starts with our Worship Team, offering songs of praise, followed by a Bible based message by one of our Pastors. After the service you are more than welcome to join us in the lobby for refreshments & fellowship. We offer a caring, quality children's program at our Sunday services. (11:00am Service: Children age 0 to 12) (6:00pm: Children age 0 to 4) We encourage you to check out a service on-demand. You can find them in the media section of our website, as well as on our Vimeo, and YouTube pages. 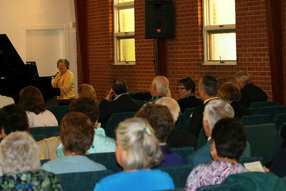 Crossroads is a church home to a multi-faceted group of people. Looking into the sanctuary at a service you'll see a diversity of ages from youth to over 100+ years old. As the saying goes "None of us be perfect," but we are a community of people who are seeking God, and seeking a personal relationship with Him, and His people. If you're not a Christian, first, we want you to know that God loves you, and He wants to have a personal relationship with you through His Son, Jesus Christ. Secondly, we encourage you to check us out online, through social media, and by coming to the church for a Sunday service, or one of our various groups that meet during the week. When you think of the word "church" you may picture stained glass windows, pews, marble floors, and other images like that. 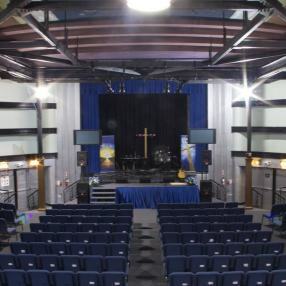 While there are churches that are just like this, our building is an old movie theater called The Lane Theater. Our faith is serious, in that we do everything we can to make sure that our teaching and methods are Biblically accurate, but we're casual in attitude. Something to keep in mind is that every Christian, started life not being Christian. We all made a choice to follow Christ, and we invite you to come and see what Jesus Christ is all about. Born in Brooklyn, NY, Pastor Ray moved to Staten Island at the age of five, growing up in South Beach. Raised Roman Catholic, he started to earnestly seek God at the age of 18 and accepted Christ as his personal Savior. From there, he knew his life calling was to be a Pastor in Staten Island, so he enrolled at Philadelphia Biblical University (now known as Cairn University) graduating with a degree in Biblical and Pastoral Studies. Next, Ray attended Liberty University receiving his Masters of Divinity Degree. Ray met his wife Jennifer at Philadelphia Biblical University and they married in May 2002. Jennifer is a local school teacher, they are the proud parents of Joseph John who was born in 2008, and Benjamin Ray born in 2014 Some of Ray’s hobbies include: reading books on leadership and discipleship, of which Charles Swindoll is his favorite author, and playing sports such as basketball & football. He is also an avid sports fan with his favorite teams being the New York Giants & New York Yankees.